My first one since 2010, oh gosh, okay. This is my new home in Cosmos. I’ve been filling it with odds and ends, and quirky adorableness. I really love collecting gorgeous things and putting them all in one place to remind me how creative and amazing designers make our digital world. From teacups to my little meeroos to landscaping, i love it all. As a fellow designer, I can really see, uniquely, how much love and care goes into every single item. 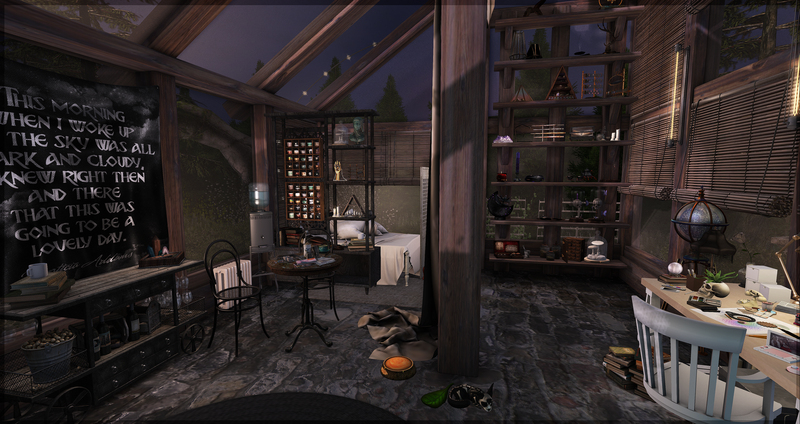 :[P]:- Consta Tapestry:// Morticia , :[P]: -Globa Decor Celestial RARE , :[P]:- Lila Succulent Goth , :[P]:- Tri Witch Supplies RARE, :[P]:- Flora Samples Celestial , :[P]:- Pyra Decor RARE , :[P]:- Vindeluna – Shimma Cloches , :[P]:- Vindeluna – Ralla Jewelry Holder , :[P]:- Lila Succulent Goth , :[P]:- Vindeluna – Valah Tea Set , :[P]:- Mohma Cloche (Candles) , :[P]:- Traveling Potions:// Potion Maker Case RARE , and more from Plastik on the back shelves. Jack Meeroo, who is now 2304 days old. oh my gosh. ~ by Vae on January 10, 2018.